lemonpi » Think spice, think Panforte! Last Christmas was all about mince tarts, but this year I’ve fallen in love all over again with that spicy, fruity and nutty Italian treat, panforte. Literally meaning “strong bread”, it is also known as Siena cake; named after that region of Italy where is it considered a speciality. The best panforte I’ve ever tried, was made by a chef I used to work with. He would make huge batches of it to be sold during Christmas, and I recall watching him struggle with stirring the honey syrup into the flour, spices, fruit and nuts. The trick with making panforte is to stir the ingredients together quickly while still warm before it starts to set too much – which can be problematic when making a large batch. He was straining so hard there was literally sweat pouring down his brow and it almost looked as though either the wooden spoon he was using, or his arm, would give at any moment. But the toil was not in vain, because once cooked and sliced, the rest of us would bicker over the delicious off-cuts. It was so tasty that if we needed to come to blows in order to get the biggest pieces, I’m sure I would’ve been the first to throw a punch. The December theme for Sunita’s Think Spice event is cinnamon, one of my favourite spices, and also a spice which features in panforte. Unlike most traditional panforte recipes, this one from Belinda Jeffery’s Mix & Bake is easier as it doesn’t involve taking the honey/sugar syrup up to a soft-ball stage. 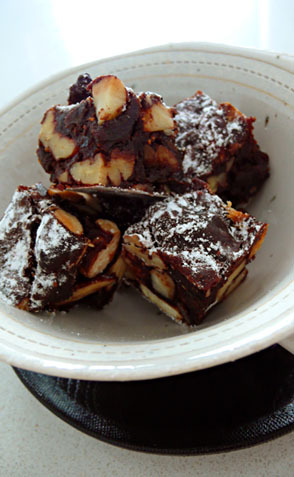 The end result is delicious, but is also slightly softer than the chewy panforte I’m used to. This could quite possibly have been due to my use of very soft, reconstituted-style dried figs, so don’t let that deter you from trying out this simple recipe. Preheat your oven to 180’C. Butter a shallow 22cm round cake tin and line the base and sides with edible rice paper or baking paper. In a large bowl, use a balloon whisk to thoroughly mix together the flour, cocoa, cardamom, cinnamon, nutmeg and pepper. Add the figs, glace fruit, pecans and macadamias and mix them thoroughly together. Tip the almonds onto a baking tray and roast them for about 5 minutes or until they’re pale brown. Timing is important in the next step as the almonds need to be hot when you use them. Meanwhile, put the butter, sugar and honey into a small saucepan over low-medium heat. Warm them gently, stirring until the sugar has dissolved, then stop stirring and bring the mixture just to the boil. 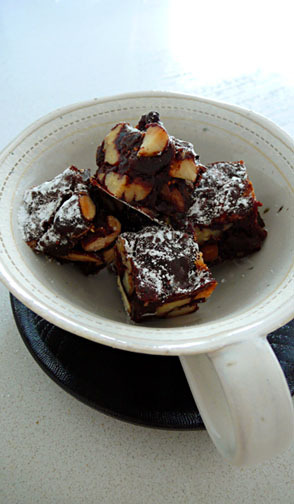 Immediately tip the hot roasted almonds and the hot syrup into the fruit and nut mixture. Quickly mix them together until they’re well combined. You need to be somewhat speedy here as the syrup and almonds must be hot so that everything mixes together easily; if they’re cool the mixture tends to harden and clump together. 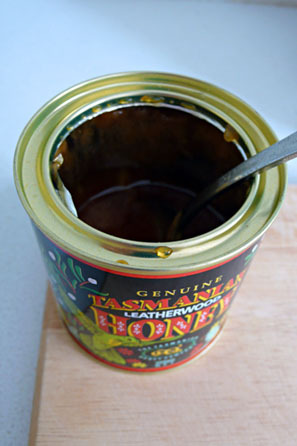 Scrape the mixture into the prepared tin and use a palette knife or the back of a spoon to press down and flatten it out evenly. Bake for 30 minutes; at this stage it will still appear somewhat soft when pressed (don’t worry – this is as it should be as it firms up considerably once it cools). Cool the panforte in the tin on a wire rack. Once it’s cool, turn the panforte out and remove any baking paper (the rice paper is edible and can stay put, just trim it if it sits up above the edge of the panforte). 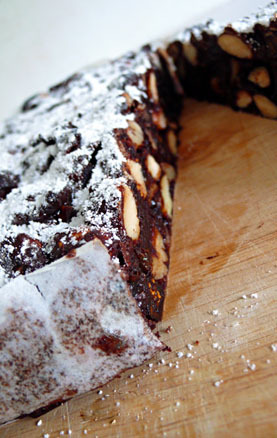 If serving immediately, dust the panforte with icing sugar and cut as much as you want into narrow wedges. Tightly wrap any leftover panforte in plastic film and foil (or put it in an airtight container) and store it in the fridge, where it will keep for weeks. I’ve been meaning to make panforte ever since i got my new Kenwood (18 months ago!). At the point where all the ingredients are mixed together, is it too hard for a kitchen machine to manage? Is it a hands-on-only job? But seriously, I think the machine would handle it fine, especially if you’re using the above recipe (which doesn’t boil the syrup to the soft ball stage), though I would still favour stirring by hand, because the mixer might crush the nuts.